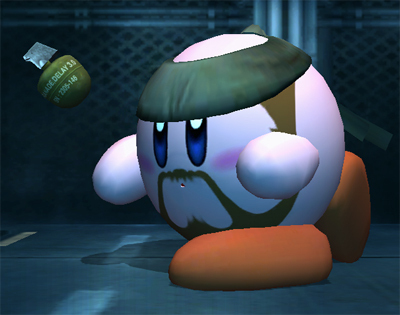 Snake Kirby. The best one yet. Kirby after inhaling Snake. Wallpaper and background images in the Super Smash Bros. Brawl club tagged: super smash bros. brawl veteran snake kirby. This is awesome!! I wanna see sonic kirby! oo and charizard kirby!! also how will olimar kirby work? i mean kirby takes their standard special moves but for olimar thats pikmin pluck. so kirby will just pull random pikmin out of the ground and not be able to do anything with them..?